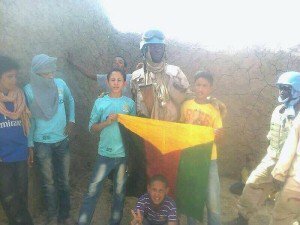 UNITED NATIONS, June 18 -- When Mali's Foreign Minister Diop came to the UN Security Council stakeout on the morning of June 18, Inner City Press asked him about the photograph of UN MINUSMA peacekeepers with the flag of break-away Azawad. He told Inner City Press, Ask MINUSMA, ask the UN. So at the June 18 noon briefing, Inner City Press asked UN deputy spokesperson Farhan Haq what the UN's response was to the photograph, and resulting protests against it in the capital, Bamako. Haq said that seven Burkinabe peacekeepers had been sent home. But when the Security Council consultations ended, envoy Bert Koenders headed toward the escalator. On the way in, he'd said he would take questions after the closed-door meeting. Inner City Press -- on behalf of the Free UN Coalition for Access - gestured, and Koenders to his credit returned. But why then were seven peacekeepers from Burkina Faso disciplined? We'll have more on this. Inner City Press also asked Koenders about Herve Ladsous' procurement of drones for northern Mali, without any formal approval. (Ladsous refused this question on May 29, video here.) Koenders said the Council heard about it earlier in the day. But is that approval? A Permanent Representative on the Security Council complained to Inner City Press that MINUSMA's force commander wasn't present for the meeting, wasn't even invited. Inner City Press aksed Koenders, who said force commanders are always invited, MINUSMA's just wasn't here this time. An irony was that while only Inner City Press asked UNTV questions to Diop and then Koenders, to the side outgoing French ambassador Gerard Araud and his spokesman then another staffer were providing their spin, off camera. Who runs Mali? Inner City Press asked Koenders if the Malian Army had given MINUSMA or the French Serval force advance notice of its May 21 offensive. “No,” Koenders said plainly. That's to his credit, and so we'll end this report right there. Unlike Ladsous, at least Koenders takes questions and answers them. Watch this site.